There are enemies against your Divine Destiny and I am passionately concerned about Humanity and the Church in this hour and time. 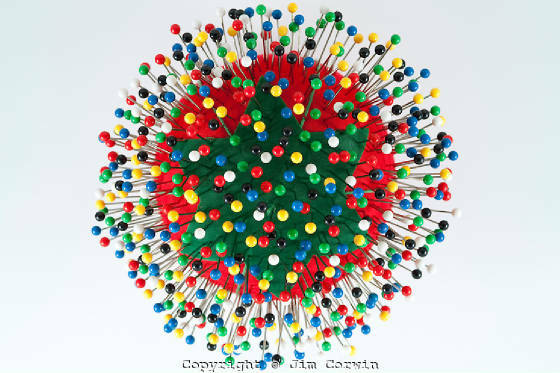 God gave me a vision of a simple little pin cushion which is used to hold stickpins. This pin cushion I saw was filled with many, many stickpins - on the top, sides, and bottom. The Spirit said, "This is a picture of how "Error" has infiltrated the church, the body of Christ, to deter man from his/her God-given destiny. I could feel the Holy Spirit grieving. I became burdened for lost souls who yet wander in the wilderness of dry lands filled with pits, pens, caves and dens - all to throw God's children off or away from their true paths. With much study, research, fasting and praying in the Spirit, Detours to Destiny was birthed. The spiritual talks, revelations, warnings, exhortations, etc. are brilliant and definitely God-inspired. I am still grateful and amazed over the revelation of my own errors: interpretations of the scriptures; traditions that didn't promote the kingdom of God; religious spirits...etc., and I am yet learning, yet amazed. I humble myself at His feet. I'd rather be told the truth than to be lied to any day! Thank God He has blessed me with an open mind and heart to seek His truths against all odds and the mind to change accordingly. God made me hungry for the Truth through as I continued to suffer daily with severe pain, trouble, and hardships on every side I have had to endure. I needed answers and guidance and could not find it. When something isn't working and promises are not being fulfilled, it's time to start looking, seeking, and soul-searching. This has been my journey - a quest for truth. The quest continues and I am sharing the revelations as the Spirit gives them in obedience to God. Father, I pray, give me the plan, the know-how, the tools to do whatever it is You would have me to do with Your visions You have shared with me. I am nobody without Christ in my life the center! Remember that JUDGEMENT must first begin at the house of God. The ERRORS must be gone before He comes back for His church without spot or wrinkle. HAVE YOU HEARD OF THE KUNDALINI SPIRIT YET? According to folklore, placing a tomato on the mantle of a new home guaranteed prosperity and repelled evil spirits. If tomatoes were out of season, families improvised by using a round ball of red fabric filled with sand or sawdust. the good-luck symbol also served a practical purpose—a place to store pins. Typically, the tomato is filled with wool roving to prevent rust, and the strawberry is filled with an abrasive to clean and sharpen the pins.